Installing a gas appliance requires a Gas Safe Register registered engineer. The Gas Safe Register requires all their members to adhere to strict registered guidelines and standards. Never allow an engineer who is NOT qualified to work on, or install any gas appliance. When your selected Gas Safe Register engineer arrives at your home, check their credentials by asking for their ID card which displays a photo of the engineer and a unique registration number. If your chosen installer / engineer is not Gas Safe Register registered you new gas stove will no longer be covered under the manufactures warranty and may be unsafe to use. In the unfortunate circumstance that your stove requires repairs under warranty you will be required to show proof that the installation was by a Gas Safe Register registered engineer. If you are unable to provide this evidence you gas stove will not be covered by your warranty. Your Gas Safe Register engineer will register you appliance with Gas Safe Register, who will forward you the required documentation showing that you used a qualified installer. The Leeds Stove Centre offers a gas stove fitting service in our local area, if you require assistance in finding an engineer in another area please click here to be directed to the official Gas Safe Register website where you will be able to find more the information and registered installers in your area. 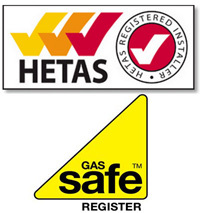 * The Leeds Stove Centre accepts no liability for anyone choosing to use the Gas Safe Register service and it is your own responsibility to satisfy yourself that your chosen installer meets all the relevant safety standards required and is suitably qualified to carry out the installation of your chosen goods. The installation of an electric fire can be a very straight forward process; some stoves only require being plugged in where you place them. When installing your new electric stove pay attention to the fitting instructions that are provided, these instructions will give you all the relevant safety and correct operating information and let you know whether the require stability brackets attaching which can be the case with free standing electric stoves. If your stove installation require electrical work to be done, such as extra or re-wiring, it is a legal requirement under part P of the building regulations act to have all work done certified by a qualified electrician. Ensure that your electrical isolator is accessible if you are installing eithe a fixed fused spur or a plug socket. The installation of wood burning and solid fuel fires and stoves requires an installer who is registered with regulated schemes such as HETAS, details of these regulations can be found in part J of the Building Regulations code. The Leeds Stove Centre uses HETAS qualified engineers for the installation of our solid fule stoves. To find a qualified engineer in your local area, click here to go to the HETAS website where you will also find more information on installing this type of fire. More information and advice about installing a solid fuel stove or fire can be found by contacting reputable builders, chimney sweeps and lining companies. The flue is the passage that carries / draws the smoke away from your solid fuel stove to the terminal or exit point (chimney pot). When buying a new stove you are highly recommended to have your flue checked. This is to ensure that there is no leakage from the flue escaping into your home which is potentially life threatening. Your flue will be smoke tested by a professional who will place a smoke pellet into your stove and burn it to see if the smoke is taking the correct route out of the chimney and that there is no leakage. The pellets also have a distinctive smell to them to allow you to check all the rooms which the flue passes through including the loft or roof cavity. Chimney sweeps and fireplace fitters / installers will be able to assist you with testing you flue and some may be able to carry out this process for you. Houses built pre 1914 should have the flues thoroughly checked as these are likely to have leaks due to their age. Houses built post 1945 will normally have been fitted with gas stove which do not damage the flue like wood burning or coal fires. Regardless of the age or type of fireplace, you should always have you flue checked as the original build quality cannot be guaranteed. Chimney sweeps and reputable builders will be able to advise you on any leakage from your flue and be able to advise you on how to repair the damage which can be carried out by specialised flue repair and fitting companies. If you wish to install a solid flue stove or fire but do not have a way of installing a flue, or if your flue has been bricked up, you may be able to have the obstruction removed or if not it may be possible to have a hole created in a wall to allow an external flue to allow the smoke to escape.